A solid night of sleep does wonders for the senses. When I arrived in Taiwan it was dark, raining and mostly unappealing. The next day however (after realizing that I was in fact, in Taiwan) I wake up amped at the thought of kickstarting my day in a new country. After paying for the first couple of nights at the hostel we set out for breakfast. The kind lady at the front desk assures us that there is a great place for a traditional Chinese breakfast just around the corner and scribbles out a map on small piece of paper along with our order written in Mandarin to make sure we get the right food. After taking a look at her map I’m skeptical about our chances of finding the place. It takes us a while (after walking in the complete opposite direction) but eventually we end up in a large 2nd-floor cafeteria lined with food stalls. In front of one stall there’s a long line of diners extending from the cash register to the stairwell at the back of the cafeteria. The whole place is packed with people eating, conversing and taking pictures of their food with smartphones and large DSLR cameras. If this isn’t the place, who the hell cares. One thing I’ve learned about seeking out good food in foreign countries is that if the locals are lining up, follow suit. We hop in line and I begin scanning the room to see if anyone has noticed the brown gentleman with mop hair and his short female companion who have just entered their popular food haven. No one seems to care. I can’t help but compare the situation to Korea, where it was an everyday occurrence that someone would gasp or sigh or point whenever I’d walk into a local restaurant or market. I played it off as best I could, but it got old pretty quick. As we approach the counter I notice a room off to the side with glass walls where food is being prepared by a small platoon of women . 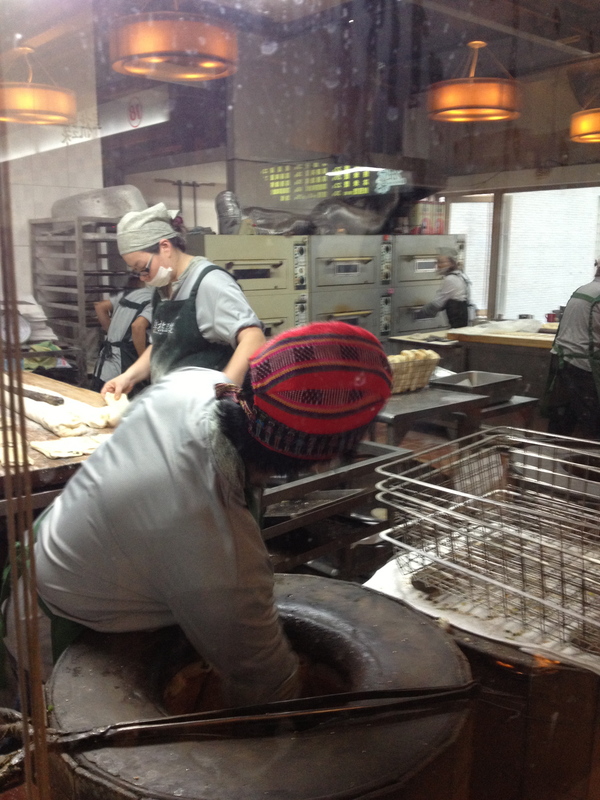 Dough is being stretched, cut, sprinkled with sesame seeds, rolled into long buns and tossed into a circular kiln looking device where it sticks to the the outer walls and and begins to cook. My mouth starts to water. I have my Nikon on me, but I decide to simply snap a couple photos with my iphone as I didn’t want to tinker with camera settings and loose my spot in line. Making Shao Bing at Fu Hang Dou. 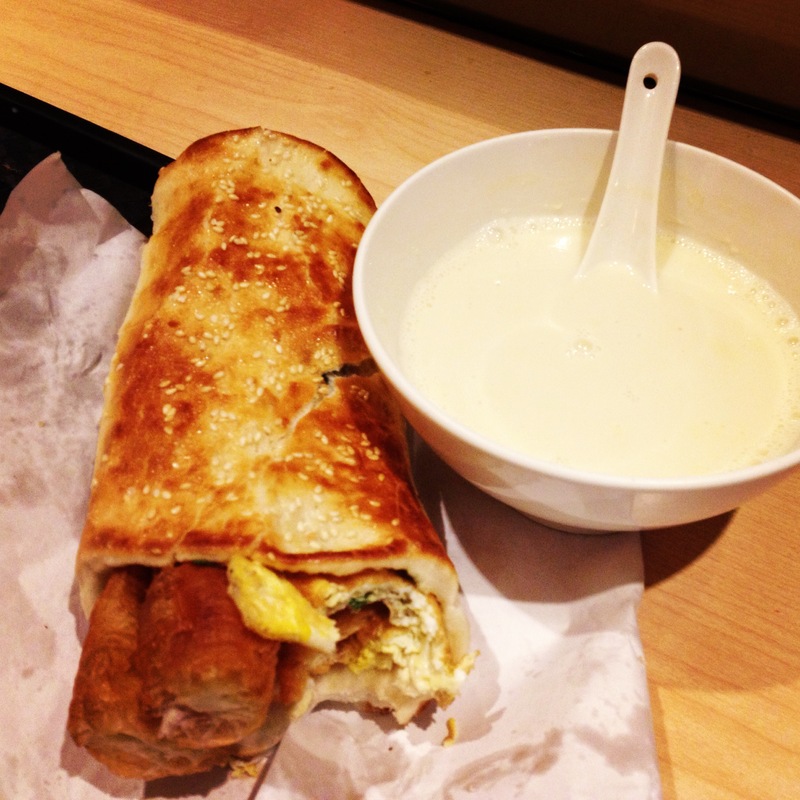 Just about everyone is ordering the same thing: A bowl of hot milk-like liquid, the aforementioned hoagie roll split open and stuffed with what looks like an omelette and a churro, and a some type of tortilla folded together with egg and drizzled with…cheese? Behind the counter is another platoon of women (I think I saw one male stocking to-go containers in the back) working with assembly line precision taking and preparing orders. We hand our little paper over and make a sign that we would like two of everything. “Hot or cold,” she asks. Within moments we have two bowls of the same frothy milk-like substance that everyone else has, but nothing more. “Is that it?” Kay looks at me as if I know what’s written on our small order slip. We move along to the register with our bowls and proceed to pay. “One six-ta-hee!,” says one woman. “No, no, no. One six-ta-heee!” A second woman joins her and they it together: “One six-ta-ta-ta-heee!” They both let out a loud chuckle while patting each other on the back. I chuckle as well and hand over $160 Taiwanese dollars. “That can’t be all we ordered.” Kay is now convinced that, despite having no idea what the lady at the hostel wrote on our little slip , that more food is coming. 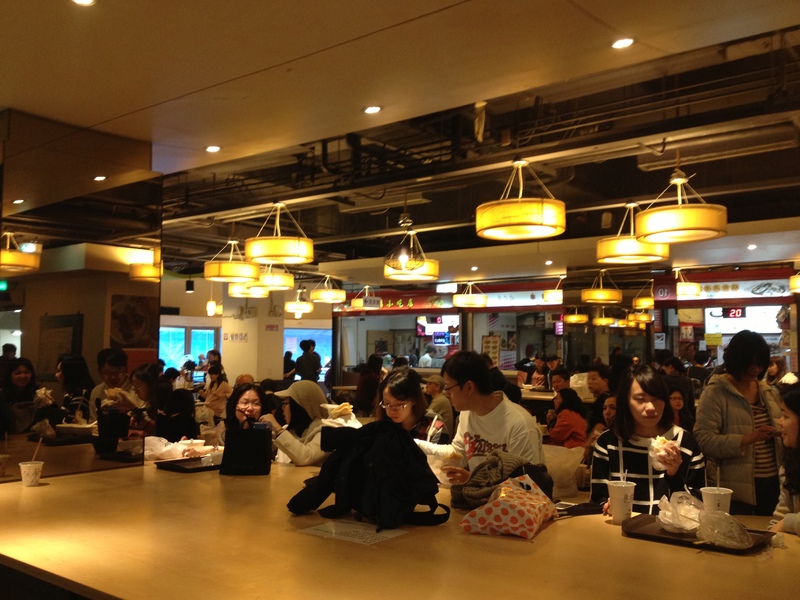 I insist that we have all that we ordered and we find seats along a along a counter in the cafeteria. I take a few sips of the hot liquid. It’s semi sweet, and taste similar to the the Cream-of-Wheat my grandmother used to make. Seconds later the “one six-ta-hee” lady appears and hands us the rest of our order: two hoagie-like breakfast sandwiches. Kay was right. We should’ve waited. 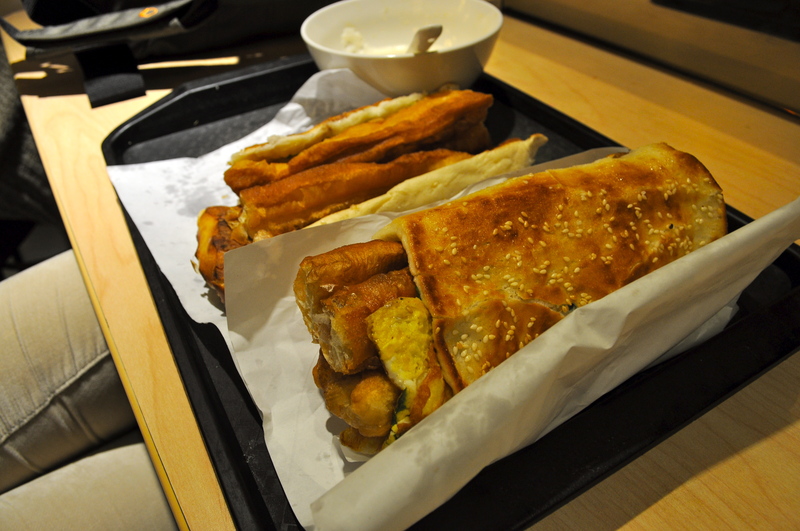 I would later discover (thanks to my homie Google) that our breakfast consisted of “shao bing” stuffed with a Chinese style doughnut and green omelette. The steamy white liquid turned out to be soy milk. We gobble down our food and head out down the back stairwell. By now the line has quadrupled in length and its almost noon. I’m stuffed and hoping that Kay won’t mind coming back to the same place tomorrow. Fu Hang Dou Jiang (阜杭豆漿) inside the Hua Shan Market building, 2nd floor. Take the Blue line MRT to Shandao Temple Exit 5. The Hua Shan building will be on your right. Breakfast runs from 5:30-1230. Expect to wait in line. This entry was posted in Food, Travel and tagged Asia, Breakfast, Chinese, Food, Mandarin, Shao Bing, Taipei, Taiwan, Travel by Jay Woodson. Bookmark the permalink.